Israel’s bombardment of Gaza killed over 1,300 Palestinians, a third of them children. Thousands have been wounded. Many victims had been taking refuge in clearly marked UN facilities. The most recent attack on Gaza is only the latest phase in Israel’s oppression of the Palestinian people and appropriation of their land. Israel has never declared its borders. Instead, it has continuously expanded at the expense of the Palestinians. In 1948, it took over 78 percent of Palestine, an area much larger than that suggested for a Jewish state by the UN General Assembly in 1947. Contrary to international law, Israel expelled over 750,000 Palestinians from their homes. These refugees and their descendants, who now number millions, are still dispersed throughout the region. They have the right, under international law, to return to their homes. This right has been underlined by the UN General Assembly many times, starting with Resolution 194 in 1948. In 1967, Israel occupied the remaining 22 percent of Palestine: the West Bank and Gaza. Contrary to Article 49 of the Fourth Geneva Convention, Israel has built, and continues to build, settlements in these occupied territories. Today, nearly 500,000 Israeli settlers live in the illegal settlements in the West Bank (including East Jerusalem), and the number grows daily as Israel expands its settler program. Israel has resisted pressure from the international community to abide by the human rights provisions of international law. It has refused to comply with UN Security Council demands to cease building settlements and remove those it has built (Resolutions 446, 452 and 465) and to reverse its illegal annexation of East Jerusalem (252, 267, 271, 298, 476 and 478). Since September 2000, over 5,000 Palestinians, almost 1,000 of them minors, have been killed by the Israeli military. Eleven-thousand Palestinians, including hundreds of minors, languish in Israel jails. Hundreds are detained without trial. In addition, Israel is breaking international law by imprisoning them outside the occupied territories, thereby making it almost impossible for their families to visit them. Every year, hundreds of Palestinian homes are demolished. The Palestinian population of the West Bank and Gaza livesw imprisoned by walls, barriers and checkpoints that prevent or impede access to shops, schools, workplaces, hospitals and places of worship. They are subjected to restrictions of every kind and to daily ritual humiliation at the hands of occupation soldiers and checkpoint guards. Invasion, occupation and plantation of their land is the reality that Palestinians have faced for decades and still face on a daily basis, as their country is reduced remorselessly. Unless, and until, this Israeli aggression is halted, and the democratic rights of the Palestinian people are vindicated, there will be no justice or peace in the Middle East. Israel’s 40-year occupation of the West Bank and Gaza must be ended. The occupation can end if political and economic pressure is placed on Israel by the international community. Recognizing this, the Palestinian people continually call on the international community to intervene. * The Irish Government to cease its purchase of Israeli military products and services and call publicly for an arms embargo against Israel. * The Irish Government to demand publicly that Israel reverse its settlement construction, illegal occupation and annexation of land in accordance with UN Security Council resolutions and to use its influence in international fora to bring this about. * The Irish Government to demand publicly that the Euro-Med Agreement under which Israel has privileged access to the EU market be suspended until Israel complies with international law. * The Irish Government to veto any proposed upgrade in EU relations with Israel. 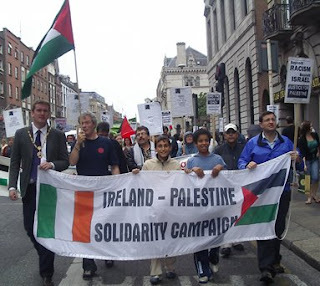 * The Irish people to boycott all Israeli goods and services until Israel abides by international law. I am glad to see people moving to save thousands of innocent souls, great post, passionate in an excelent way, thank you. Thank you for your lovely comment anrhima. We need to know that others support those who need it and that together we are stronger.